Students protesting in Myanmar have clashed with riot police in Letpadan, 90 miles north of Yangon, the country’s largest city and former capital. Several hundred students began trying to break through police lines which prevented them continuing a march south. Police are reported to have hit the students with batons and detained some. The students say they want changes to be made to a new bill which they say centralizes control over higher education. Tensions have been rising in Letpadan since last week, after police gave them a deadline to disperse. There had been reports of negotiations between the two sides, and earlier on Tuesday a breakthrough agreement was announced, granting the students permission to continue on their journey to their final destination – Yangon. Myanmar’s Irrawaddy newspaper reported that despite this deal, conflict broke out when authorities refused to allow student flags to be hoisted. Some 200 students attempted to push through several hundred police officers and several fainted or cut themselves on the barbed wire barricades, the newspaper said. Several were dragged into trucks, AP reported. Some were chased into a Buddhist monastery where they have been taking refuge, according to Reuters. “Many have been beaten and some have been arrested, including many female students,” one student protester, Honey Oo, told AP. The changes to the new education law that the students are calling for include decentralizing the school system, giving students the right to form unions and teaching in ethnic minority languages. The group began their march in Mandalay in January and has been halted in Letpadan for more than a week where police blocked their path with vehicles and barbed wire barricades. Some of the protesters and their supporters were also arrested earlier in the week. Five students were reportedly detained in Letpadan on March 6 but have since been released, and eight were detained and later freed in Yangon. 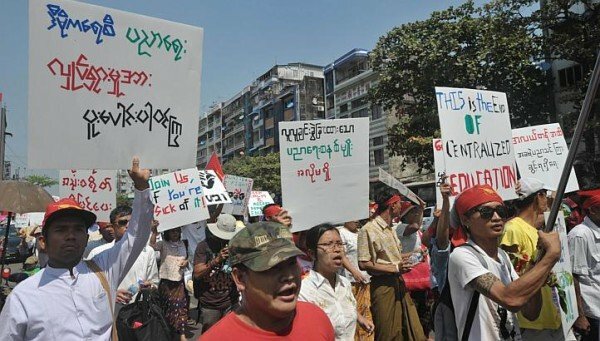 Young Burmese have been at the forefront of several protests in Myanmar over the years, including a notorious 1988 uprising against the former ruling junta.